Lieutenant-General Gerhard "Gerd" Barkhorn (20 March 1919 – 8 January 1983) was the second most successful fighter ace of all time after fellow Luftwaffe pilot Erich Hartmann. 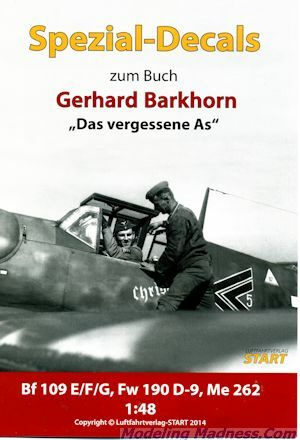 Barkhorn flew 1,104 combat sorties and was credited with 301 victories on the Eastern Front against the Soviet Red Air Force piloting the Messerschmitt Bf 109 and Focke-Wulf Fw 190D-9. He also flew the Me-262 but it is unclear if he flew combat with this aircraft. He flew with the famed Jagdgeschwader 52 (JG 52—Fighter Wing 52), alongside fellow aces Hartmann and Günther Rall, and Jagdgeschwader 2 (JG 2). Less than two weeks later he left JG 52 on the Eastern Front and joined Jagdgeschwader 3 (JG 3), defending Germany from Western Allied air attack. The final unit with which he is associated is JV-44. This new sheet from Start provides markings for 15 aircraft that were flown over the years by Barkhorn. This covers 1940 until the end of the war in 1945. I have reproduced some of the options above. 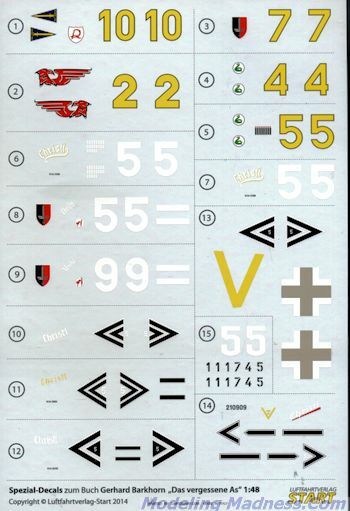 The sheet provides only the unique markings for each option and requires the use of kit decals for the rest. 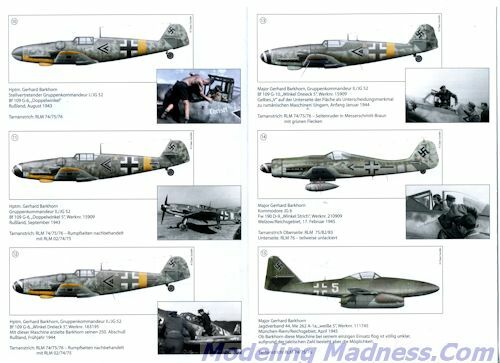 Covered in the sheet are the Bf-109E/F/G, FW-190D, and Me-262. Included is a superbly researched instruction sheet that includes profiles of all the aircraft as well as a photo of most of them, some in full color. Camouflage information for each is also included. The text is in German, but that should not be all that much of a problem for most modelers. In all, it is a great sheet that provides a lot of options and is very much worth having for your next build. Review sheet courtesy of Luftfahrtverlag-Start where you can order your copy.